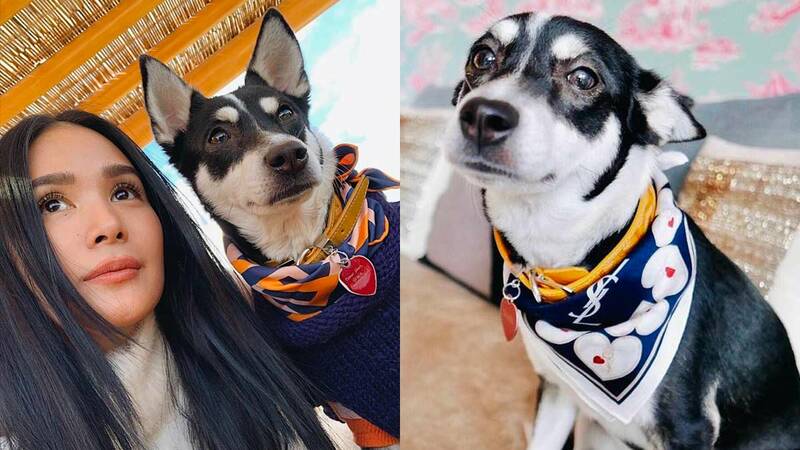 Heart Evangelista loves her dogs so much, she even lets them wear designer scarves! The 33-year-old fashionista posted a photo on Thursday, January 3, and it caught the attention of netizens. One eagle-eyed follower noticed that the scarf had prints similar to Hermes' Lettres au Carre scarf 90, which is priced at $395 (P20,712). In the comments section, she asked, "Is that Hermes scarf on her?" Heart simply replied with a "Yes." Panda owns more luxury scarves apart from this one. In a separate post, Panda was seen wearing a Louis Vuitton monogram print scarf. Louis Vuitton scarves run from $370 to $480 (P19,401 to P25,169). Another post showed Panda lounging on a Louis Vuitton's Catogram Classic Blanket, which has an estimated price of $1,420 (P74,500). Panda also has a YSL cotton neck scarf, which has an estimated price of $145 (P7,602).